On Sundays in Lent, we’ve been highlighting opportunities to follow Jesus in new ways. After all, you can’t yuck it up with the Saintly Smackdown forever. Today we’re talking about Grow Christians. A couple of years ago, Scott (of SEC fame) and Nurya Love Parish rode to the airport together after a conference. They started talking and were lamenting how there weren’t great blogs around for Christian parenting that worked for Episcopalians and other mainline Protestants. Soon Nurya and Scott were plotting and scheming, and the result is Grow Christians. 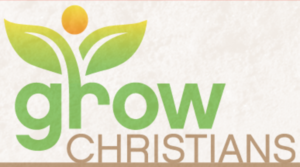 Grow Christians aims to create an online community of discipleship focused on the practical details of life at home. Gathering reflections, stories, images and recipes from diverse folks, this group blog inspires generations to come together as they celebrate the presence of God through the Christian year. Grow Christians started as a pilot project for Lent 2016, a partnership between Forward Movement and Plainsong Farm. Today Grow Christians is operated by Forward Movement, and Nurya serves as editor and visionary-in-residence. Several times each week, Grow Christians publishes on topics related to faith at home. Lent Madness fans will be especially interested in articles about how to celebrate the saints’ days at home. But there are also article on raising kids in the Christian faith or talking about difficult subjects. You’ll find great writing, ranging from poignant to prophetic, from humorous to handy. Visit Grow Christians (www.growchristians.org), where you can sign up to receive emails whenever there’s a new post. You can also find Grow Christians on Facebook. You might like to know that Grow Christians sometimes gives stuff away, and there’s a giveaway running right now. You could get a bunch of great kids’ books for free! Find the details on how to enter over at Grow Christians. Forward Movement is a self-sustaining ministry of The Episcopal Church that has been inspiring disciples and empowering evangelists around the globe since 1935. While they produce great resources like Forward Day by Day, Lent Madness, books, apps, and curricula, Forward Movement is not a publishing company, but is a ministry. The mission is to support you in your spiritual journey, to make stronger disciples and followers of Jesus Christ. Each year, Forward Movement donates over 100,000 resources for Bible study, daily reflection, and spiritual nourishment through free online offerings like this one, and gifts to prisoners, hospital patients, and nursing home residents. Plainsong Farm is a ministry in the Episcopal Diocese of Western Michigan, practicing faith in place as disciples of Jesus Christ, providing food, hospitality and farm-based education to those of every faith and none, for the glory of God and the stewardship of God’s creation. In 2017 Plainsong Farm is beginning seasonal worship, partnering with donors and agencies to deliver fresh local produce to emergency food pantries as well as community supported agriculture shareholders, developing future environmental education and faith formation programs, and continuing to connect and catalyze the Christian food movement. Check out Grow Christians. It might be just the thing you need — after the Golden Halo winner is crowned — to help you follow Jesus at home. 7 Comments to "After the Madness: Grow Christians"
Although our children and grandchildren are grown, I love reading Grow Christians regularly. Few of our family are interested in religion or church, so I look for ways to keep the invitation on the table and often find new and different perspectives with Grow Christians, THANKS BE TO GOD! In the spirit of Christian unity, I am curious (CURIOUS) why you thot available parenting resources didn’t work for Epicopalians and mainline Protestants. worship in an Episcopalian church. I’m so curious where our disconnect is. Perhaps a phone conversation would be more appropriate! Hello, I attend a Lutheran church in Staten Island NYC and have seen our numbers dwindle over the years to about half. I was wondering if anyone can explain why Christians are turning away from “mainstream” worship. What is it about our style of worship that no longer appeals to people. Mainstream churches don’t have that many options for services. The typical Protestant church has one, two, or perhaps three services on Sunday mornings and maybe one during the week. One of our local nondenominational megachurches has services on several weeknights so people don’t feel they need to come to church on Sunday mornings. Mainstream churches lack a critical mass of members. Our local Roman Catholic church has 5,000 families which means there are enough people to put on big fundraisers, do community service, and pack the pews at 8-10 Masses each week ranging from Saturday afternoon to Sunday evening. Because of the shortage of facilities in many cities, especially athletic facilities, we find that church members have to choose between attending church and having their kids participate in sports; teams are routinely scheduled for games on Sunday mornings. And many other activities require that the families attend at any time over the weekends, such as travel sports or performing arts. Once you’re out of the habit of attending church it’s difficult to come back. People want to worship at their convenience and they want the flexibility to be on the other side. Services on call and online. They want to listen to a praise band playing familiar music rather than hear something different — and possibly be expected to sing as well. Stadium seating and cup holders in the churches. Stand up for the Gospel? Really? I belong to a large Episcopal parish and we do traditional music and our main problem is lack of sufficient parking. We Lutherans have the same practices. PS-I’m going to check out the Growing Christians resource. Your stuff is AHsome!